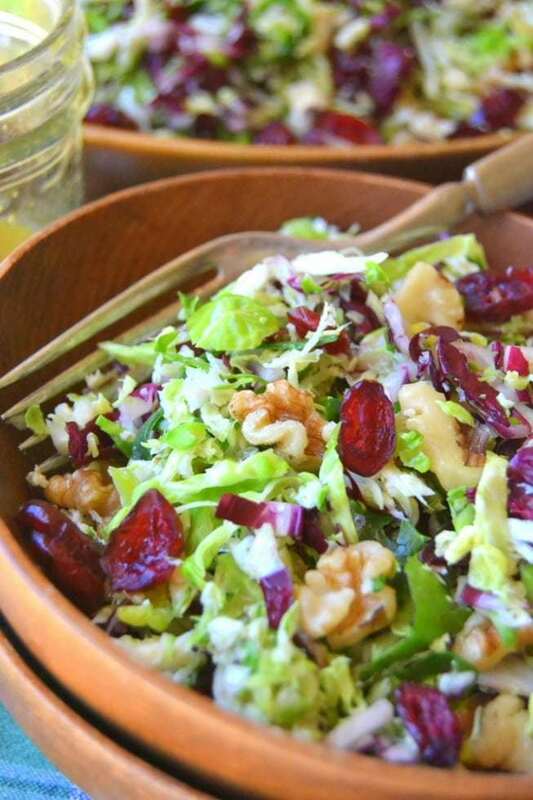 Brussels Sprout Slaw with Maple Cider Vinaigrette is a delicious healthy salad that adds a bit of fresh green to fall and holiday tables. Wash and trim the sprouts. Finely shred them in a food processor fitted with a shredding attachment, or by hand with a sharp knife. If you use a knife, separate the shredded slices with your fingers. Wash, quarter, and core the radicchio. Finely shred it as well. Combine with the sprouts. Toast the walnuts over a medium heat for a few minutes until you can smell their aroma. Let cool and then give them a rough chop. Add to the salad along with the cranberries. Whisk together the dressing ingredients and toss with the salad. Use more or less dressing to your taste. You can do this a couple of hours ahead, but the salad is best eaten the same day. If you do mix the salad ahead of time, don't add all the dressing to it. Save some to toss in just before serving.